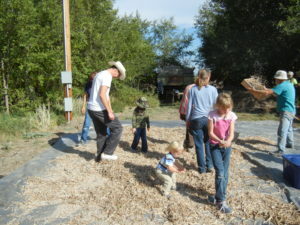 Hands on seed growing, harvesting and cleaning classes will be offered by LEF at its home on Meadowlark Farm in Scottsbluff, Nebraska, on Saturday September 1. They will b e followed by the Sixth Annual Labor Day Seed Festival, which will be a celebration for everyone, on Sunday and Monday September 2 and 3. Western Nebraska is an excellent location for small scale organic vegetable seed production, and organic seed is a high value specialty crop for which the demand far exceeds the supply. However, farmers who may benefit from growing this specialty crop may not have the knowledge or skill, or access to appropriate sized seed processing equipment and facilities. Isolation from potential cross-pollination is also important. 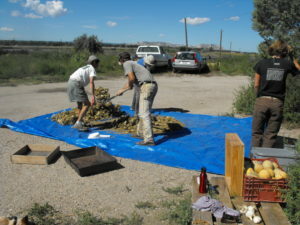 Meadowlark Hearth Farm in Scottsbluff, Nebraska, is in its sixth year of small scale organic seed production as part of a diversified Biodynamic (R) farm. Farmers Beth and Nathan Everett-Clark have over thirty years experience in vegetable production and trained in Europe in growing vegetables for seed. 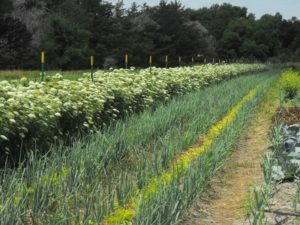 Currently, through Meadowlark Hearth Seeds, they both grow vegetable seed and work cooperatively with a number of other farms in the region to sell through seven organic seed companies.